Daily 9 a.m. to 5 p.m. (weather permitting). Tickets may be purchased in the Lighthouse, the Keepers Cottage (Chamber of Commerce & Visitors Center), the Treasures of the Gulf Museum and the Port Isabel Historical Museum..
PLANNING A TOUR? For rates and information regarding organization and school group tours (minimum group of 20) call Jeannie Marie Aby Flores at 956/943-7602 or email: jrivera@copitx.com. 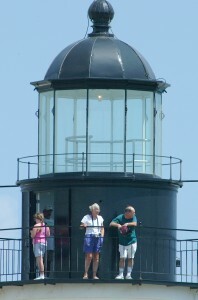 Tour form here> http://portisabellighthouse.com/lighthouse/admission-info/group-tour-form-info/. NOTE: No more than 60 students per hour. Special arrangements must be made for groups over 60 and no group shall exceed 80 individuals. Tour time for one museum is 45 minutes to 1 hour and 2 ½ to 3 hours for all three sites. IMPORTANT: One adult sponsor for every 10 students. No food, drink or chewing gum. No pencils, pens, markers or crayolas or any other writing instruments. All ticket sales are final. Tickets can be purchased at any of the Museum facilities or at the Visitors Center in the Keepers Cottage and need not be redeemed in the same visit. The Port Isabel Lighthouse is operated by the City of Port Isabel.